By Dan Ambrose: For boxing fans worried about the December 13th fight between Tim Bradley (31-1, 12 KOs) and Diego Chaves (23-2, 19 KOs) possibly not taking place, Top Rank promoter Bob Arum is saying that the fight will indeed be taking place on this date at the Cosmopolitan of Las Vegas, in Las Vegas, Nevada, USA. The contract for the fight has already been signed by Chaves, so the fight is good to go, according to Steve Kim. There had been rumors floating around that Chaves, 28, holding out for more money. But luckily for fans the fight will still be going ahead as previously planned. This is going to be a good fight potentially if Bradley elects to make a fight of it instead of using movement for 12 rounds like he sometimes does. Chaves has excellent punching power, and an entertaining fighting style that will make this a good fight if Bradley stays in the pocket to slug with him. #3 WBA, #5 IB Bradley is coming off of a 12 round decision loss to Mannny Pacquiao last April, and he needs a win right now in order to stay relevant. Bradley wants to fight the winner of the Saul “Canelo” Alvarez vs. Miguel Cotto fight. The only way that will happen is if Bradley beats Chaves, and Cotto comes out on top against Canelo. It’s not likely that Canelo will want to waste a fight battling Bradley, because it’s not a match-up that will make him any money. Canelo can make a lot more money fighting WBA Super World middleweight champion Gennady Golovkin after Cotto rather than facing Bradley. 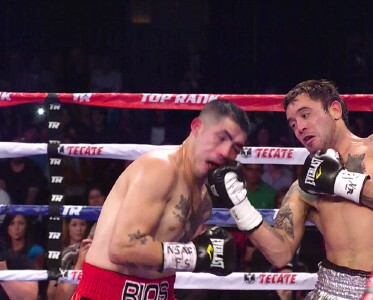 On the undercard of Bradley-Chaves, light welterweight Mauricio Herrera will be facing Jose Benavidez. Matt Korobov will be battling Andy Lee for the vacant WBO middleweight title.